LBS: A Burger Joint at the Red Rock Casino was on the list of Las Vegas burgers that I wanted to try. Granted, LBS was also a Chef Anthony Meidenbauer creation. Holsteins was the other Meidenbauer burger in Las Vegas, which I had previously reviewed. Sadly, at Holsteins, quality was spotty. Still, LBS was close to my hotel, and I wanted to taste a burger from the original spot. Secure in the knowledge that LBS had been in operation since September of 2008, I guessed that any quality control issues would have been addressed long ago. What struck me, immediately, was the fact that the menu at LBS was a near duplicate of the menu at Holsteins. The LBS menu was less comprehensive, but I recognized nearly every item on that smaller menu from its sister restaurant at The Cosmopolitan. I had the opportunity to speak with Chef Tim Kocher. The young chef was Paul Smith's College trained, and he had a genuine passion for his craft and the burgers that he was creating at LBS. 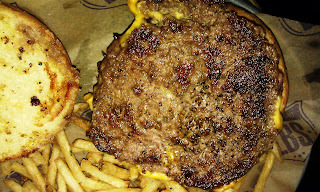 I ordered the Plain Jane burger with American cheese, and settled in for 10-minute wait. While I was awaiting my humble single burger patty, a small group arrived and ordered two of the LBS Extreme Burgers. Each started with a daunting 6 burger patties (3 pounds), which were interspersed with American cheese, bacon, and a Ghost Chili (Indian Bhut Jolokia peppers) sauce. The peppers were hot enough, that I was denied my request to taste the sauce, since a waiver was required...gulp. Beyond that, the burgers were topped with some vegetation...the assembled burgers each came in at just over 14 inches tall. They were accompanied by a full pound of fries. If a diner was able to clean their plate within 60 minutes, the meal was free at LBS. Otherwise, it came with a price tag of about 30 bucks. Both challengers that I encountered on the day of this review were well on their way to paying for their burgers. 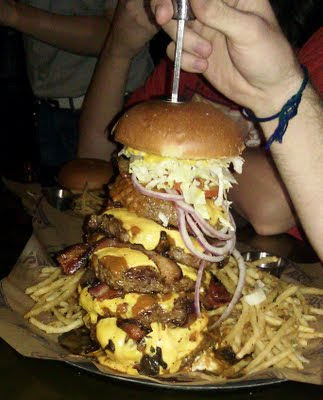 The record for downing the 4 pounds of chow that comprised the LBS Extreme Burger Challenge was just under 14 minutes. The same man that performed that feat also took down the ridiculous 6-pound burger with a pound of fries at LBS in 34 minutes. That burger was known as The Grave Digger. The Beef: The beef at LBS came from Premier Meat Company. 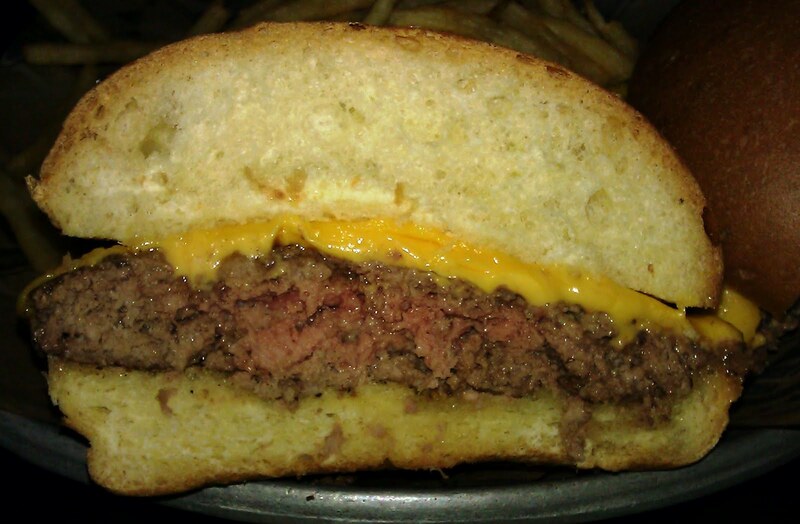 My burger was made from a pre-ground, custom blend of Chuck, Rib Eye, and Strip. The fat content was kept down to 20%. About 15% of the beef content was dry-aged, and the rest was a secret. The buger blend at LBS and, presumably Holsteins, was bespoke. Premiere Meat Company was not permitted to provide the same blend to other restaurants. The patties were delivered pre-formed. The beef was quite good. The Chuck delivered strong and sustained beef notes. The Brisket provided the perfect, long-grained mouth feel, and the Rib Eye delivered mineral notes and steak texture to round out the bite. I assumed that the Reb Eye component was dry aged. The dry aging brought just the right amount of mild funk to the palate. The burgers were toothsome and juicy. No greasiness was noted. The beef was spot on. The Seasoning: The blend was unseasoned, but the flat surfaces of the burger patties at LBS were perfectly seasoned as they cooked. The salt and pepper served to substantially enhance the beefiness already present in the juicy burgers. The Sear: The sear on the unevenly formed patties was predictably uneven, but it was highly satisfying in the spots where it had fully developed. A slightly hotter flat-top would have created a perfect sear, but this one was in the right neighborhood. The Preparation: The cheeseburger at LBS just came together splendidly, and I attributed most of this to good preparation. All of the components of the burger blended seamlessly in the bite with no jarring exceptions. All of the ingredients were solid and solidly prepared. The beef was ground to a medium coarse, and it was cooked on the griddle/flat-top a little past the Med-Rare, which I had requested. This was a fine trade off. The sear was better developed, and more of the colagen from the Chuck melted to generate additional beef flavors. The Cheese: There were numerous choices at LBS, but I opted for the American cheese on my Plain Jane burger. Chef Kocher must have read my mind when he applied two slices to my burger. The cheese was thick, gooey, and enormously satisfying. This burger was difficult to put down. The melted American cheese bridged the gap between bun and beef with savory creaminess. The Bun: Like Holsteins, LBS also used the Bon Breads products. The brioche-style bun was fresh, moist, springy, and mildly sweet. It served as an ideal foil to the firm, savory beef. The bun was nicely toasted around the edges to deliver some crunch. The Sides: The Lamb Wesson fries were skinny cut and cooked in a properly hot canola oil. This resulted in fries, which were golden and crisp. The fries arrived par-cooked and frozen, and the par-cooking yielded a fry, which was creamy in the center. The fries were also brined, so they were satisfyingly salty throughout. Like Holsteins, LBS battered the fries prior to cooking them. As a result the fries were especially crisp, and they held the seasoning effectively. I also sampled the Fried Cheese Curds. These were a nice twist on fried cheese. The cheese curds had a firm and springy texture. The frying process served to exctract a little of their moisture and enhance their alreadly hearty texture. 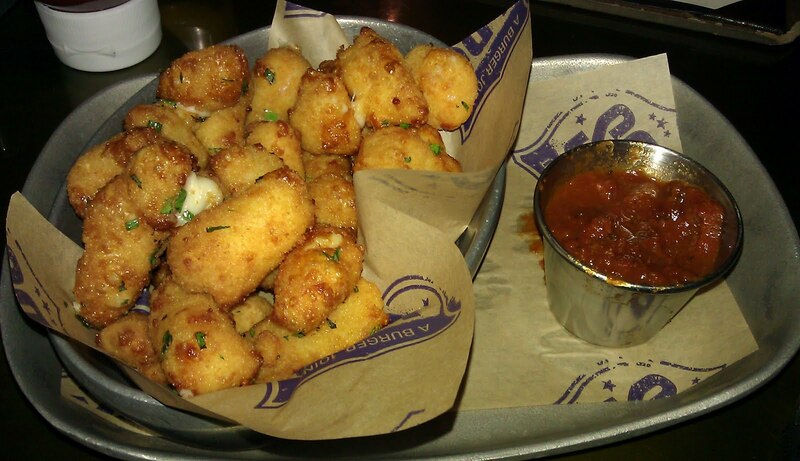 The Fried Cheese Curds were delicious. The Toppings: The Iceberg lettuce and tomato slices were both wonderfully fresh and flavorful. The Shakes: I sampled the Chunky Monkey shake, and it was a lot like a banana split in a glass. That is to say, it was completely decadent and delicious. The Value. The Plain Jane burger with fries was about $10. This was a 1/2 pound burger with a generous portion of fries, and everything on the plate was of high quality. The burger value at LBS was STRONG. 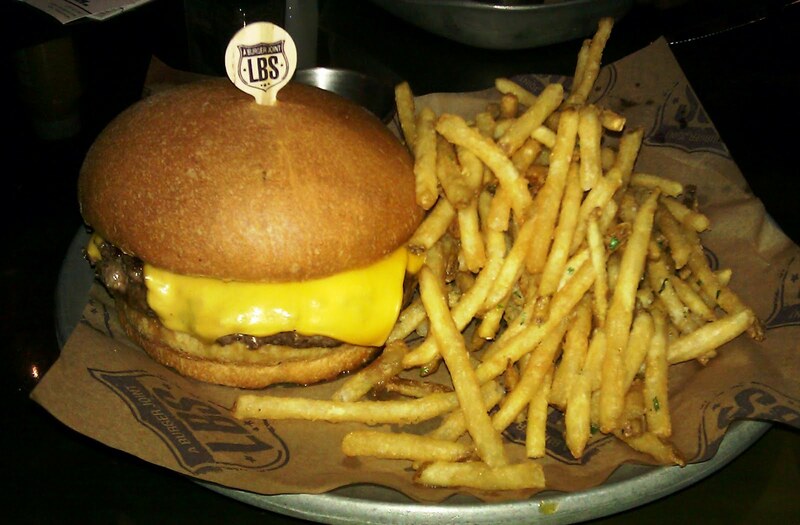 LBS served up a solid, well-prepared, high-quality burger. It didn't have much of a wow factor, but it was highly satisfying, and it just felt good to eat it. It was a very comforting burger. 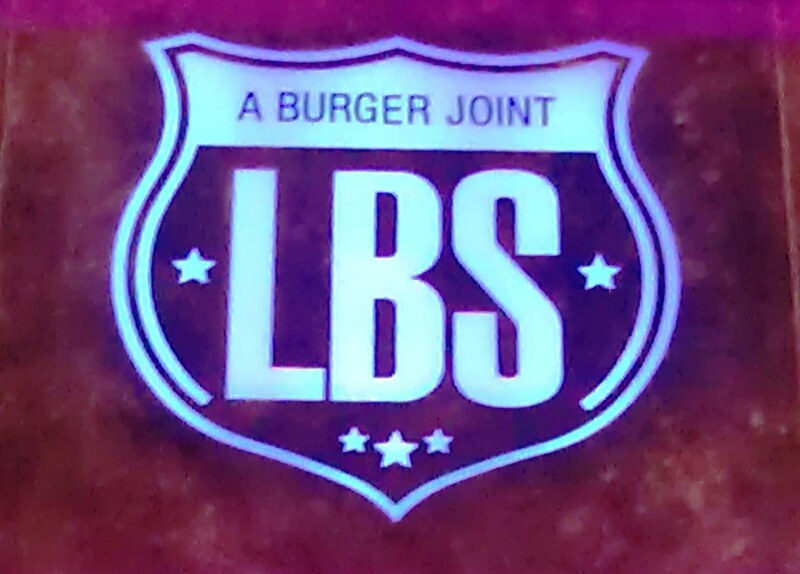 Burger Review : LBS was worth the 10-mile trek from the strip. It was a strong burger at a strong value.